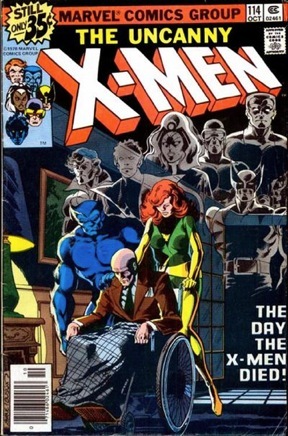 Many years ago, I wrote that a movie adaptation of the Uncanny X-Men would never happen because of the vast number of superheroes that would all require exposition and character development, leaving very little time for actual storytelling. Additionally, the general public just wouldn’t be able to accept a movie with that many characters in crazy costumes. Of course, Bryan Singer proved me wrong with 2000’s X-MEN , a movie that deftly juggled eleven mutants, good and evil and told a story that was compelling and cohesive (in addition to dealing with the “yellow spandex” via a terse one-liner from Cyclops). X2 introduced even more characters, but was an even better movie. However, by the third film, Brett Ratner’s X-MEN: THE LAST STAND , the overwhelming number of heroes and villains finally trampled the story, and the whole thing felt like a catalogue for action figures more than a good superhero yarn. X-MEN ORIGINS: WOLVERINE was even worse, pulling characters seemingly at random from the Marvel Mutant Universe. If I were a bigger X-Fan, I might be more bent out of shape about the declining quality of those movies, and really have no idea what to expect from this week’s prequel, X-MEN: FIRST CLASS. I love the idea of a superhero period piece set in the 1960s, but the trailers have left me mostly cold (even without the presence of Iceman, who, in the comics, was one of the first students at Professor Charles Xavier’s School for the Gifted). 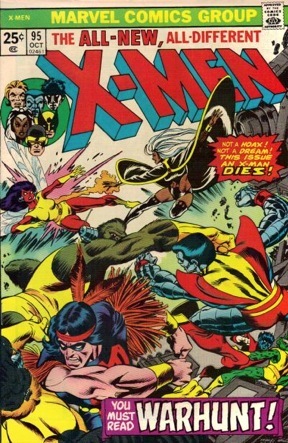 Like most fanboys, I ate up Chris Claremont and John Byrne’s X-MEN series of the 1970s / 80s, although I grew weary enough with Marvel’s subsequent mutant overload to lose my taste for all the various and sundry X-titles by the middle of that most dayglo of decades. 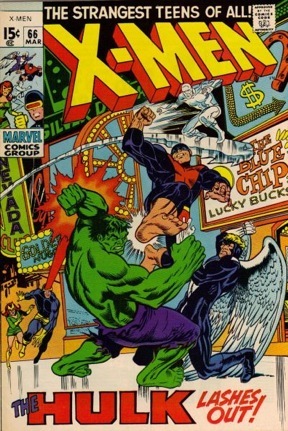 I actually had a hard time selecting covers for this Bronze Beauties installment, as X-MEN’s covers weren’t the most stunning on the spinning rack in the 1970s. Now, if I were to include some of Jack Kirby’s, Jim Steranko’s or Neal Adams’ covers from 1960s, you’d see some really gorgeous comic book covers, but this is Bronze Beauties, not Silver Stunners… however, if you’re interested, take a gander at the first two pages of covers at the Grand Comics Database. The second regular issue featuring the All-New, All-Different X-Men includes the Native American mutant, Thunderbird, who had the sad fate of being killed off in his second adventure (He should’ve been tipped off by his absence from the cluster of X-heads by the logo). To date, Thunderbird has yet to make it to any of the X-Films, despite the built-in merchandising possibilities for both booze and cars. 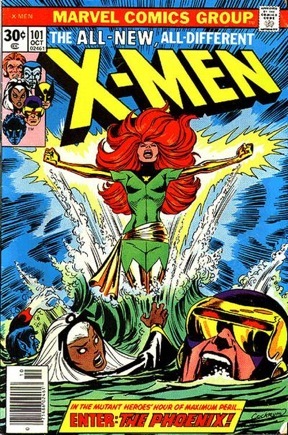 This is one of the most pivotal issues of the series, in which the formerly tame Marvel Girl becomes the all-powerful Phoenix (whose story really should’ve been the full thrust of the third X-Men film). All of the X-Men died except for Beast and Phoenix and there was never another issue of their comic book (yeah, right). This cover is a nice example of how in the comics, Wolverine is really short (Storm just towers over him).